Just a week ago, Newt Gingrich was back. Having won over Southern conservatives with surly debate performances (heavy on his "food stamp president" catchphrase, lectures on the malformed work ethic of poor children and eviscerations of the liberal news media), he handily won the South Carolina primary. But Gingrich lost steam this week in Florida after lackluster debate performances with a far more aggressive Romney. In an open letter on Thursday, former Republican presidential nominee Bob Dole made a case against the former House speaker. "If Gingrich is the nominee it will have an adverse impact on Republican candidates running for county, state and federal offices," Dole wrote. "Hardly anyone who served with Newt in Congress has endorsed him and that fact speaks for itself." Former House Majority Leader Tom DeLay followed suit in a radio interview, saying: "He's not really a conservative. I mean, he'll tell you what you want to hear. He has an uncanny ability, sort of like Clinton, to feel your pain and know his audience and speak to his audience and fire them up. But when he was speaker, he was erratic, undisciplined." By Friday, Romney held a nine-point lead in Florida polling. What happened? The Rev. 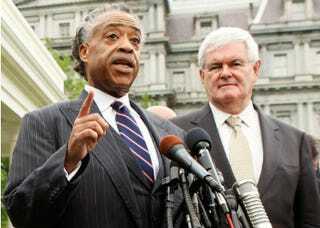 Al Sharpton, who collaborated with Gingrich on education reform in 2009, echoed DeLay's point that Gingrich is inconsistent with his views, switching them up depending on the audience before him. In an interview with The Root, Sharpton talked about Gingrich's inability to balance different messages for different people, his racial rhetoric on the trail and why their meeting on race that you may have heard about isn't happening. The Root: Why do you think Gingrich did so well in South Carolina, and why isn't his strategy working for him in Florida? Al Sharpton: I think in South Carolina he fed red meat to a lot of the far right, who wanted to see someone that would walk the straight conservative line. I think he has probably been further to the right than the establishment candidate of the Republican Party, Mitt Romney. I also think he purposefully used some race-tinged language there, calling the president a "food stamp president" and saying that he would go to an NAACP convention and tell blacks that they should demand jobs and not be satisfied with food stamps — as if we are satisfied with food stamps, and as if we're the majority of people on food stamps. Neither are true. I think he was cynically playing to a far-right crowd. But Florida is a different state. There, he's also had to balance out his message with appealing to Latinos. On one level he's still talking about food stamps, but on another level he's talking to Latinos, so it's not coming off as rough-edged. Then he's had to deal with the fact that he had a very milquetoast performance on Thursday in the debate. AS: No. I never thought it would happen. Somebody in South Carolina asked him, and he said that he would meet with me. After that I challenged him on my show, and we called him from the National Action Network. He hasn't even responded. I think he just said that to get by the voter that asked the question. And I have no interest. I don't see what we would gain. TR: Despite Gingrich's rhetoric on the trail, in the past he's partnered with African-American public figures, including the NAACP's Ben Jealous on criminal justice reform, and you on education. What is your relationship like with Gingrich these days? AS: We didn't have a relationship. We both agreed that we needed to deal with education reform. He was for vouchers and private control of charter schools; I believed that public charter schools would be good in an experimental way, but I'm not for vouchers. President Obama invited us in together and asked us to do a five-city education tour, because I think the president wanted to show that he could get people who disagree to come together. Before that, we didn't even know each other. That's why I considered his remarks [in South Carolina] so hypocritical, because he spoke at the National Action Network convention, met with the president and me and did a tour with me as the president requested. He never said any of that to our audience. He never said any of that in the five cities. He's dishonest and inconsistent. TR: Who do you predict will win the Florida primary? AS: At this point, Mitt Romney would be my guess. And let me say this: Even though Mitt Romney has not said the things that Gingrich has, Romney stood on the stage next to Gingrich and never took issue with it, never said he disagreed with it. And Romney himself has taken positions like, "Let Detroit go bankrupt," and says that poor and working-class people who are talking about economic equality are just envious of him. So he has his own baggage to deal with. If Gingrich bashed Romney with the kinds of attacks that he was before, then he might have a chance to get back ahead, but I don't know if he can get an audience. His shot was Thursday night at that debate, and when he didn't come prepared, I think he hurt himself.